The quote is from Abigail Chen, MD, who I shadowed yesterday as I was shown UNITE HERE’s implementation of the Ambulatory ICU (you can read more about the A-ICU concept here). Before I get to that though, I arrived in the morning with my usual level of interest in both seeing how patients benefit from health information technology and integrating into the flow of the medical center as unobtrusively as possible. A few pictures (click on any to see full size). I have to admit I got caught up in learning about the team care concept and didn’t get as many photos as I wanted to. Next time! Fortunately, Andrew Tzellas, MD, quickly slowed down my CPU and invited me into his team’s huddle for the morning. I was invited to have a seat next to Palmeras and Nancy, team experts on chronic disease management and coverage, and then joined by Jenny, the clinic coordinator, Andrew, and his medical assistant. As they started the huddle, Nancy printed off the day’s schedule and gave them to me so I knew what general issues the team was working on. 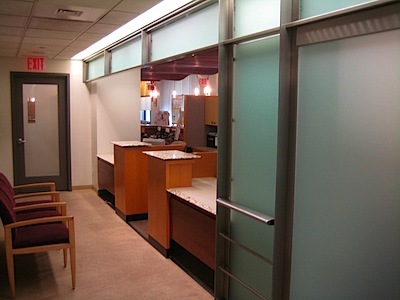 Each patient in this ambulatory clinic was reviewed by the team across the spectrum – health status, disease management, social and coverage issues. 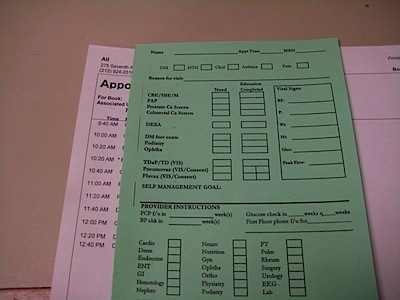 A green tracking slip was pre-filled by Palmeras for each patient and added information about due health maintenance. Andrew and Jenny, each viewing the electronic health record, worked with the team to create the day’s plan. While this was happening, walkie talkies would announce patients’ arrival (I wasn’t paying attention to this, but Jenny pointed out that the whole team was). At one point, as Andrew was talking about the guidance for a particular patient, he said, “I can inform them about my, I mean, our feeling about this issue.” The transition from individual planning to group planning of care was apparent. I sat in on the next huddle as well, this time for Abigail Chen, MD. Same flow. It reminded me a bit of being a third year medical student on my first rotation in medical school, when I walked into a functioning team (my first rotation was trauma surgery – that requires functioning!) and I was impressed with the cadence and “beat” of the group (or as they say in Japanese, takt). I could tell the teams had spent quite a bit of time forming the approach here. UNITE (formerly the Union of Needletrades, Industrial and Textile Employees) and HERE (Hotel Employees and Restaurant Employees International Union) merged on July 8, 2004 forming UNITE HERE. The union represents more than 450,000 active members and more than 400,000 retirees throughout North America. UNITE HERE boasts a diverse membership, comprised largely of immigrants and including high percentages of African-American, Latino, and Asian-American workers. The majority of UNITE HERE members are women. The Health Center itself is gorgeous, but it wasn’t so very recently. As I talked to staff, I learned about the transformation that has happened in the last 7 years, from a health center that sometimes served 100 patients on a Saturday with wait times several hours long, to a health center where customer service training is the norm, innovative approaches to chronic disease care are standard, and patients are treated with respect. I was told that staff were even trained using callers who role-played actual patients to ensure that each patient was treated with courtesy. That’s an impressive commitment. 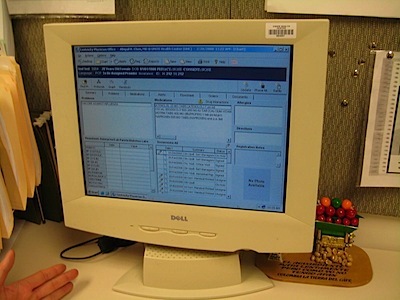 I was able to shadow a patient of Abigail’s, where she of course used the Health Center’s state of the art electronic health record, (Centricity, manufactured by General Electric). In the course of the visit, Abigail ordered some screening lab tests for the patient and took the time to explain the purpose of each, in Spanish, the patient’s native language. The patient was immediately referred at the end of the visit for teaching about pre-diabetes, which was performed by medical assistants, all specially trained in a variety of health topics. Great care was placed in involving the entire team in the care, as the quote at the top of the post states, and from my observation, this busy medical center had a more relaxed feel, or at least a feel that everyone was accountable to each patient together. This coordination did not come overnight – it came with support from leaders who encouraged innovation, and in my view of outcomes in the waiting room (where are were publicly posted), it’s working. In the background of all of this, where does patient centered health information technology fit in? UNITE HERE has a state of the art electronic health record. They are preparing to launch a patient portal which will include staff messaging and other features that are being developed now. Unlike Urban Health Plan, there is not a big pediatric population, and there is a clear emphasis on chronic disease management, team care, and a further emphasis on diabetes. The Health Center is already innovating to provide patient-centered care, which is a prerequisite for success in implementing patient-centered health information technology. 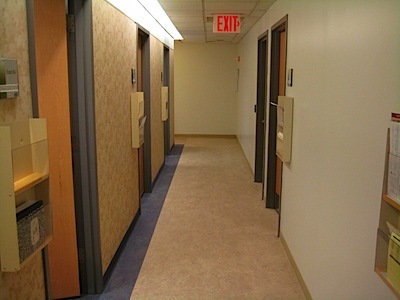 One of the tenets is “from the board room to the bedside.” In this health center, the board room is just around the corner, so it’s easy to cycle through improvements rapidly. This is the advantage of the small practice over the integrated delivery system – the risk of ideas not counting (or worse, being wasted) is less. I have not previously seen a patient portal launched off of a Centricity system, so this experience should be valuable both in the population being served and the technology being used. For a health system working to attract Union members across industries and across the geography of New York City, this will add another great reason to choose this team. This brings the number of patient accessible EHRs coming on line in New York City to three – Institute for Family Health, Urban Health Plan (Part of the Primary Care Information Project), and now UNITE HERE. All will add significant information to the conversation about patient access in a diversity of populations. This is the real thing, and they are all going to do an excellent job, and we’ll be helping along the way. Congratulations to all of the patients in these three leading health systems. Thank you again to Karen Nelson, MD, MPH, the patients, staff, and physicians at UNITE HERE for the gift of their time and (some of) their knowledge. There is a lot to learn here. Addition 2/29/08: One thing I forgot to mention that’s really important is the fact that I only shadowed one patient. The reason why is because the team appropriately asked for explicit consent from other patients who stated their preference to not have an observed visit. This is a marker of respect for the patient, because the consent is asked as a question, and the answer is listened to. I don’t think it’s a coincidence that at every site we have visited, at least one patient declines having an observer. What that says to me is that we are at a place where the patient is at the center of care. CategoriesHealth Information Technology Tagsdisparities, medical home, New York, Photos, safety net, Small Practices, Unite HERE! Hi, my name is Nora Wong- I’m a MPH student at GWU. I was wondering if you could give me the information to contact UNITE HERE Health Clinic. I would like to ask them about the sustainability of their clinic model. You wrote this in 2008 but I’m curious how the health center has been doing thus far. Thank you.